The 46th governor of the State of Michigan, John M. Engler worked closely with the philanthropic community to build institutional support for giving and service. As a government partner, he pursued policies that encouraged citizens to financially support charitable activities and used his “bully pulpit” to advocate for private citizen action for the public good – in other words, philanthropy. Governor Engler championed novel public/private partnerships such as a tax credit for gifts to community foundation endowment funds and a $20 million endowment to support volunteering, which is now known as the ConnectMichigan Alliance. He provided visionary leadership for the creation of one of the first state commissions on service, even before the establishment of the Corporation for National and Community Service. Governor Engler worked with a number of the state’s leaders in philanthropy and has been a champion for increasing and improving philanthropy in Michigan. Governor John Engler talks about the development of the Michigan Community Foundations Tax Credit. Governor John Engler talks about how George Romney, Michigan’s 43rd governor, spread volunteerism and community engagement across the state and the country. Governor John Engler talks about the value of having community members form their own foundation. 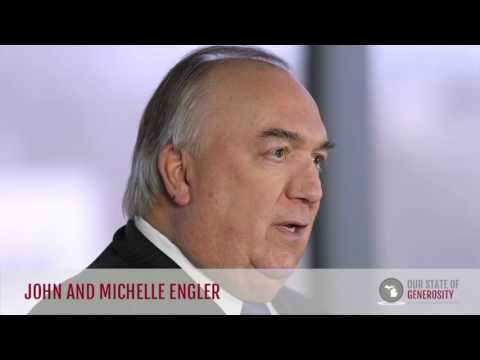 Governor John Engler talks about the expansion of community foundations across Michigan. 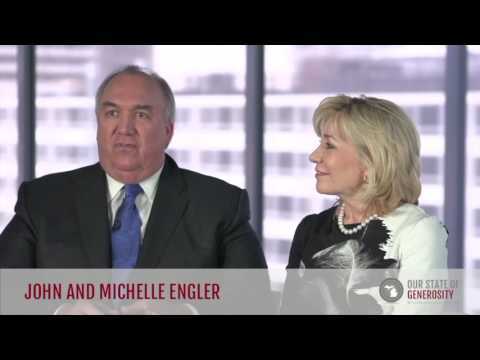 Governor John Engler talks about having a conservative approach to philanthropy. Governor John Engler talks about how most people, when given an opportunity, are happy to help. Governor John M. Engler earned a Bachelor of Science degree in agricultural economics from Michigan State University, and later went on to earn a law degree from the Thomas M. Cooley Law School in Lansing, Michigan (1). As the son of a farmer in the 1950s, Governor Engler initially experienced the effects of philanthropy while growing up in rural Michigan. He saw firsthand how his father benefitted from participating in a rural leadership program offered by the W.K. Kellogg Foundation. As John became active in the political world, he continued to witness the generosity of the W.K. Kellogg Foundation and drew inspiration from the leadership of Dr. Russ Mawby – from the time Dr. Mawby led the 4H extension program at Michigan State University to his eventual leadership of the Foundation. As Michigan’s elected governor from 1991 to 2002, Governor Engler demonstrated a firm faith in Michigan’s history and continuous presence as a philanthropic leader. Moved by the dedication of former Governor George Romney, Governor and First Lady Engler immersed themselves in Michigan’s philanthropy in various ways. In 1991, Governor Engler signed an executive order to create the Michigan Community Service Commission, a partner organization of Our State of Generosity. In 1994, he then signed a bill to make MCSC a statutory agency. Governor Engler also created many public/private partnerships throughout Michigan, including a partnership with the Council of Michigan Foundations which used funds from the Michigan Tobacco Settlement to support community foundations and promote wellness for youth and seniors. Governor Engler is also responsible for the creation of the Volunteer Investment Grants, the nation’s first volunteer endowment program. Administered by MCSC, this program built endowments that increased volunteerism statewide and balanced community foundation funds. During his tenure, Governor Engler (with the help of First Lady Michelle Engler) turned the focus of community problem-solving away from government-only efforts and pointed it back toward the engagement of the hearts and minds of the people. This was accomplished through the creation of MCSC, which promoted volunteerism and activism in a way that united diverse members of the community along with private entities. MCSC instilled volunteerism in the community, but it also acted as a means to focus the genuine time, talents, and treasures of Michigan citizens. Ultimately, this served as a way to engage community members directly in solving community problems, and also created a way to use state and federal resources in support of volunteerism. Governor Engler used MCSC to institute the Governor’s Service Awards, which has not only honored nonprofit leaders for outstanding service, but also publicized Michigan’s philanthropic presence. The results of the Michigan Community Service Commission are innumerable; Governor Engler’s action in promoting volunteerism through its creation has expanded Michigan’s philanthropic identity, and more than 2.2 million Michigan residents dedicate their time to volunteerism annually (2). Governor Engler’s spirit of giving transcended beyond the creation of MCSC, when in 1994 he expanded the Community Foundation Tax Credit program. This promoted giving for the common good and rewarded citizens for their contributions to their community foundations. In 1999, Governor Engler signed into law the Michigan Tobacco Settlement Partnership. This partnership between the state and local community foundations acted as a way to distribute funds to 65 of Michigan’s community foundations in order to promote youth and senior wellness. Using money that came from interest on the tobacco settlement revenue, this law funded programs that advocated for youth and senior wellness on both a local and regional level. These programs focused on health and nutrition, family counseling, childhood development, smoking prevention, and school programs. In signing this partnership into action, Governor Engler provided otherwise unattainable resources to communities to promote healthy living (3). Nearing the end of his administration, Governor Engler provided Michigan with yet another testament to his dedication to philanthropy. Using his executive budget, he initiated a $10 million challenge grant that was matched 1:1 by private donations from foundations, businesses, and individuals. Funds from both private and public sectors, along with the appropriate use of government resources, ultimately led to the creation of the $20 million endowment, ConnectMichigan Alliance (CMA). The purpose of CMA is to ensure the continuation, in perpetuity, of funding for Michigan’s vigorous volunteerism and service sector. Although the establishment of CMA was an ambitious goal, funding was accomplished in full and continues to provide support for the sector, to this day. CMA functions under the Michigan Nonprofit Association, a partner organization of Our State of Generosity (4). Governor Engler was interviewed regarding his insights and experiences working with Michigan’s philanthropic community and the Our State of Generosity (OSoG) partners. The following are selected quotations from his interview specifically related to the five organizing themes of the OSoG project. (1) “Governor John Engler Biography”. Michigan’s Former Governors. d. Web. 8 June 2016. Found here. (2) “Michigan Community Service Commission”. Our State of Generosity. 10 October 2015. Web. 8 June 2016. Found here. (3) “Healthy Youth and Healthy Seniors”. 2 August 2016. Found here. (4) “ConnectMichigan Alliance”. Our State of Generosity. 8 January 2015. Web. 8 June 2016. Found here.